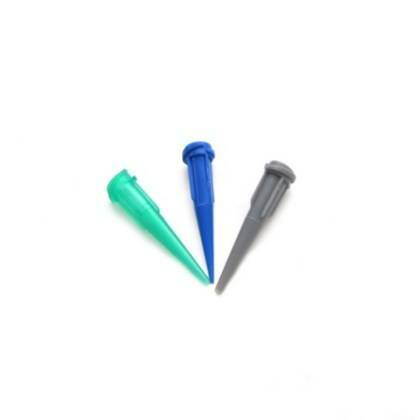 Includes three reusable tip set S(0.41mm), M(0.84mm), L(1.19mm). Can be used to fill cracks or decorate unfired pieces. Fire as low as 1200°F for 30 minutes in a kiln. This product can also be fired with a butane torch or gas stovetop. During firing this clay shrinks between 8-9%. Syringes are packed with the same silver clay but with a creamy consistency. With the syringe you can decorate your projects as if you were decorating a cake, create drawings or designs with lines, create bezels around gemstones or filigree designs. It also works to correct minor errors in pieces. Use it to fill cracks in clay or adding fine silver findings to unfired clay. It can also be use as “glue” to join or repair pieces before firing. Different sizes and shapes of syringe tips can be used to create delicate, wire-like designs.